You need to use a clearfix when you start floating elements, as the height of the parent will disappear and could potentially mess up your entire layout. A container, .content, with two floated divs, .left and .right. Floating the content creates the classic height-break in the parent container. This can be avoided by using a specific height, however that is neither practical nor dynamic. 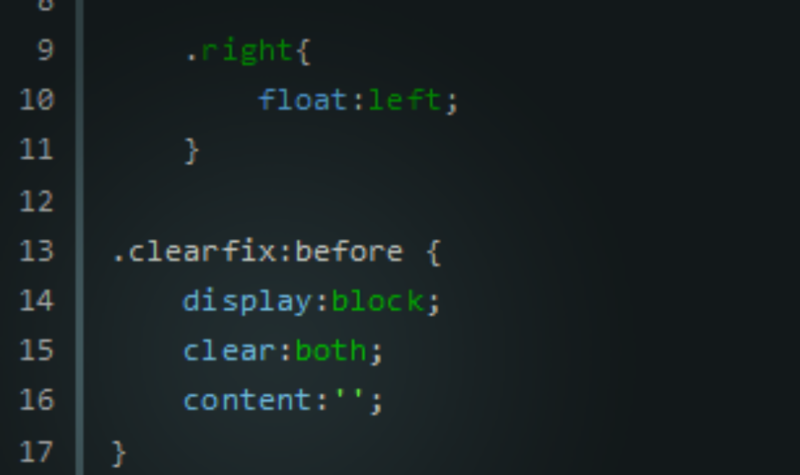 Simply have a class with display:block; and clear:both;, (we set it to :before so it acts as its own element in the style, otherwise the .clearfix values would overwrite the .content values). We also set the content:''; to blank so it actually shows up, (pseudo elements such as :before and :after don’t display without the content:; value). If you’d like some more quick-tips then have a look at all our short code snippets!